Professional artist with over 50 years practice. Work available from the studio or at solo exhibitions held by the artist in public galleries. Commissions taken. 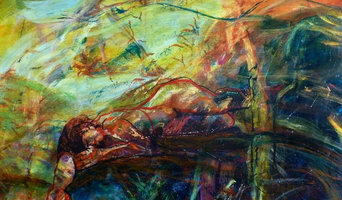 Original figurative, Expressive, abstract, colourful, Australian art. All art by Debra Dougherty. Acrylic paint on canvas or timber panel. Quality prints are also available on canvas, aluminum or paper. This is art with a lot of feeling, energy and soul. We are a specialist painting and coatings company located on the Sunshine Coast, QLD. We work from Gympie to North Brisbane. 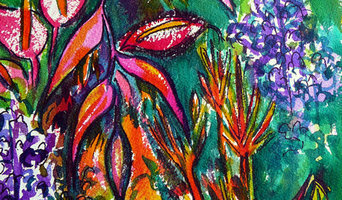 I am a Bachelor Trained Artist, l produce colourful and intricate beach influenced art paintings and prints. Fine Artist specialising in paintings in all genres, contemporary and tradition, acrylic, oil, and mixed media. My work is an eclectic mix and in a constant state of flux determined by my local physical and emotional environment. Custom artworks for homemakers, interior designers, hotels & resorts. Any piece can be painted to your size & colour specification, or I can come up with a new design for your space. We are a duo continuously moving around the globe for exciting projects to work on. Calling ourself space invaders, we work with a balanced focus on art, design and sustainability meaning our outcomes are always unique, thorough and fun. The instillations, furniture, art and interiors which we have worked on rely upon available resources and local sourcing of materials. This provides a bespoke product, always relevant to the client and the area, everything is unique. Hi I’m Scotty, I'm one of Australia's premier surf artists and the worlds only eco friendly surf artist, specialising in tropical surf scenes and traditional seascape paintings using earth friendly materials. Ideal for any home or business, my artwork has been on display in hotels, cafes, restaurants, and conference rooms across the country. My environmentally conscious surf art is sure to add a soothing, tropical splash that you’re looking for. If you are seeking a specific colour palette, configuration, or size not available on my website, I also love working with clients on customised commissions to meet specialised individual needs. My inspiring surf scenes are a reflection of the surfing fraternities endless search for the perfect wave... freedom, raw power, perfection and untouched beauty - the state in which all oceans and surf breaks should be conserved indefinitely. My attention to detail and appetite to improve means my style is constantly maturing and finding new ways to keep fans and collectors stoked. Faux taxidermy and quirky home décor from Australian artist Julia Reid. Julia works from her studio outside of Sydney creating her range from Hodi from a pallet of colours to choose from. The designs she offers have appeared on The Block, The Living Room as well as overseas blogs and magazines. A new modern gallery in the heart of Noosa Junction, featuring Paul Smith's stunning photographs of Noosa and surrounding areas. His breathtaking landscape, ocean and aerial photographs have proven popular with both Australian and international customers. His images are frequently used by major publicaitons and have been utilised by larger commercial clients such as Qantas, Tourism Australia and Virgin Airlines. 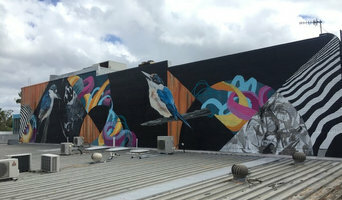 Whether you’re looking for a fun and functional piece, such as ceramics or pottery, or prefer murals and decorative painting, you’ll find many Sunshine Coast, Queensland artists, muralists and artisans on our Professional pages, ready to include you in a creative process that will result in a stylish and personality-filled home. There are a wide selection of Sunshine Coast, Queensland artisans listed on Houzz, including muralists, painters, ceramic artists, potters, ironworkers, photographers, sculpturalists, designers of decorative glass, metal wall art, abstract art, home accessories, and more. Even everyday items such as tableware, tiles, splashbacks, lampshades and bedheads can be handcrafted, painted or designed by an artisan. You will also find artisans who specialise in bespoke designs, as well as those who offer artwork consultancy. Find artists and craftsmen on Houzz. 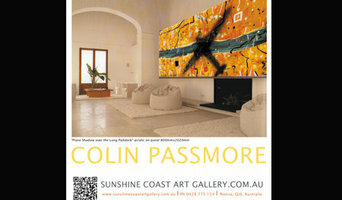 Peruse portfolios in the Professionals section to find abstract, traditional, and contemporary artists in Sunshine Coast, Queensland. Read reviews and contact artists directly to ask them more about their work.